Let’s move on to cutting the skirt portion of the Ruby Slip. 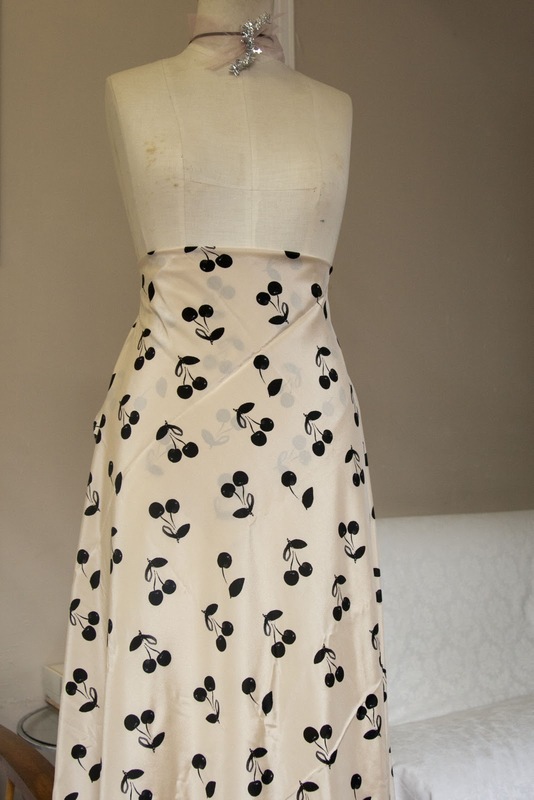 If we want the bias skirt to hang nicely, accuracy is paramount here! 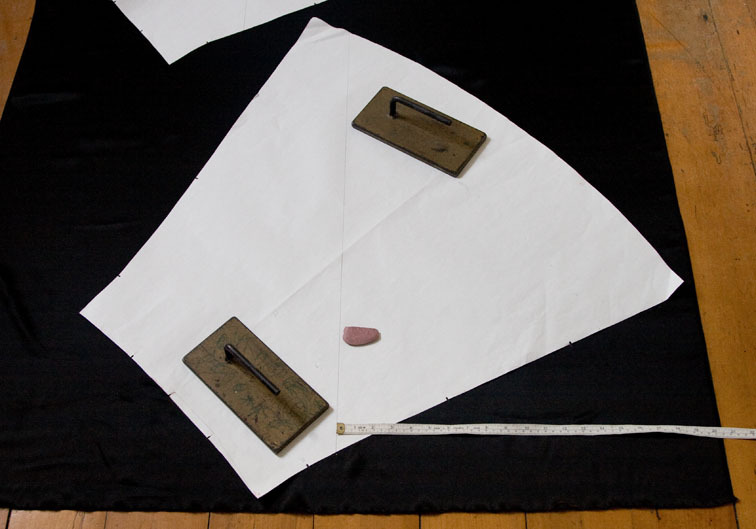 In this tutorial I am cutting my black Ruby Slip, which I thought I ironed especially for the photo….. The best way to cut the skirt is in a single layer right side up, and I’ve provided full pattern pieces so it is easy to do this accurately. By the way, if you don’t have your free Ruby Slip pattern downloaded yet, all the details are here. You will need a cutting area the size of your fabric – if you don’t have a large cutting table then use the floor (I do!) If you do use a table, it is important that there is no cloth hanging off the end – this will drag the grain out of alignment and cause distortion in the hang of the skirt. I’ve read all sorts of things about tissue underlays and tissue overlays, but I get the best cutting results the old-fashioned way – by chalking around the pattern piece with tailors chalk, and this is the method I will describe. To do this you will need to transfer your pattern onto stiff paper or card – chalking is impossible to do with tissue or copy paper. When you spread your fabric, it is imperative that the horizontal and vertical grainlines of the fabric are square across the whole piece. The selvedges and lengthwise grain should be parallel for the full length of the cloth – my floorboards came with a handy grainline! They are nice and slippery too which makes the cloth ‘float’ into position. The horizontal crossgrain must be perpendicular to the selvedge across the piece, examine the grain closely. If you have plenty of cloth you can tear it into two blocks, one for each skirt piece, to assist in squaring the crossgrain. There should be no ‘bubbles’ – gently smooth them out so the grain remains square. At this point the cat usually comes along and has a lie down! Place some weights on the fabric so it stays in place as you work, you could tape the edges in a few spots too if that will help (use Magic Tape), but remove them when you start to cut. Place some pressure with your fingers near the edge of the pattern, and the fabric will be held firm by the card as you sweep with your (sharpened) chalk. Press in towards the pattern piece as you chalk to form an accurate outline (this is why tissue is no good). If the cloth starts moving you are pressing down too hard, remember you don’t need a bold line. Sweeping in some directions is easier than others because of the grain – changing direction can help, as can shorter strokes. You can see brief glimpses of the real thing here in this video to give you the idea. Don’t forget to chalk the notches at this stage – once the panel is cut and lifted it is hard to remark them accurately, and they are really important for attaching the bodice correctly and sewing a nice side seam. 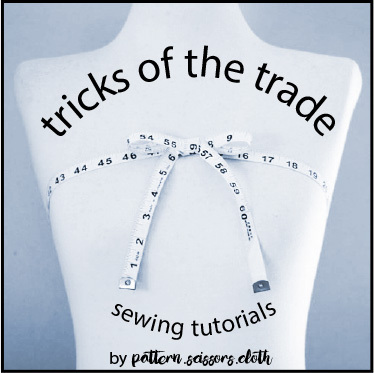 Also remember to chalk the strap pattern piece now – the measurements for this are provided in the sewing instructions, and a metre rule will be helpful for this. 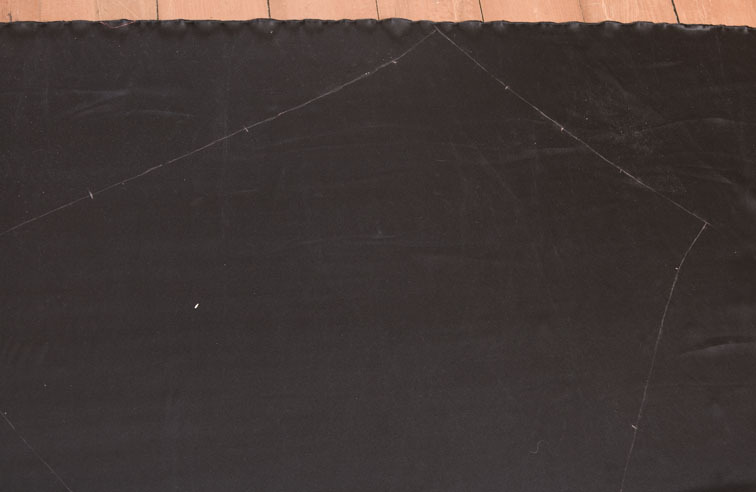 The great thing about chalking, is that the cutting lines are marked directly on the fabric so you know exactly where to cut, even if the fabric subsequently moves – and lets face it, if you are cutting a single layer of slippery fabric it is going to move the moment you slip the blade of your shears under it! You can remove the weights for cutting, it doesn’t really matter if the fabric moves a bit once it is marked – in fact you could pick the whole piece up and turn it around and your chalk marks will still be there all nice and accurate! For the record, you cut the inside line of the chalk, where the edge of the pattern was. Clip the notches 3-4mm into the seam allowance with the tip of your shears. Once you have cut a piece, fold it in half right side in and place a small chalk cross on the reverse so it is easy to tell right from wrong sides. Try not to overhandle the pieces and distort the grain, and don’t hang them up either, just leave them lightly folded for now – ok, you can quickly hold the front up against yourself to admire how your new slip is going to look for a moment! Quite a few of you are asking about an FBA, and yes I will show how this is done. If you are forging ahead yourself, keep in mind that the underbust region needs to remain large enough to slip over the bustline, so the skirt will need altering also. I might just change my plans for this fabric now! I will show you how to make adjustable lingerie straps for too, using bra rings and sliders, and you could use fabric straps or purchased ribbon. If you would like to try this instead of cutting the bias spaghetti strap, cut two straps about 60-70cm long and 4 times the width of the ring/slider, on the lengthwise grain. Tomorrow we get stuck into the lace – Happy Cutting! Thank you Sherry, for providing this pattern! I'm intrigued that cutting the “skirt” part of the slip on the straight grain will result in it not hanging correctly. I'll will tape the pattern up and see if I can answer my own question! Sar's p.s Can I come back here for an answer if I can't figure it out? Thanks for the key info – I like the idea of chaulking the lines — but how do you sharpen the chaulk? I can't find any info on that. Good info on cutting the skirt. I will have to refer back to your photos when I cut mine. Lynn – I sharpen my chalk by scraping the edges with a blade. I designed the pattern sheet so it is really easy to grade up or down a size if you wish – give it a go! I've always been curious about chalking around a pattern and then cutting – now I know you have to have the right paper! As always very useful and informative. Aloha Sherry! When I print the first page of your pattern, the box measures 9.25 cm instead of 10 cm. Should I just make a size that is a bit larger, or do you know of a way to get the box to be 10 cm when you print it out? Thanks. Fantastic way of marking..just done it and it worked very well!! I had the same printing problem as MushyWear. What you do is when the printer's dialog box pops up, you need to make sure that the page scaling is set on “none”, otherwise the printer “shrinks the page to fit” and you end up with the 9.25 cm. I started chalking because pinning and cutting took too long and didn't seem very accurate. My chalk tracing is nowhere near as detailed as your method, but now I know I'm not being lazy. Chalking is a “real” technique. Thanks so much Elle for answering! That should work Shannon, but let me know if it doesn't! Hi Sherry – I know it's been awhile but would you happen to remember the name of that beautiful white with black cherry fabric posted above? I am so in love with it and and dying to get my hands on some. Please let me know, you can reach me at dmacreative@aol.com. Thank you so much – I also can't wait to sew up your Ruby Slip, I will post a pic in your flickr group when it's done!